I never really thought of baking as a remarkable "skill" until I realized how many people simply don't do it. My Mom always baked, everyone in my family bakes, so I always thought this was the norm. It wasn't until a grammar school cake sale that I realized that we seemed to be the exception to the rule. Of course, I brought one of my Mom's cakes to donate to the cake sale. When I asked why my Mom's cake was priced higher than all the rest, they said it was because "This was a cake made from SCRATCH." I had never even heard that expression before, and when they explained it, I thought, "Wait, how else do you make a cake?" I also remember my Mom and my Aunt Bet would always donate cakes to bake sales and then would buy them back. I remember Aunt Bet saying "Well, why would I want to buy someone else's cake? Mine is the best one there!" Too funny. When I became an adult, I seemed to have a growing reputation as the guy who bakes, and luckily I have a family of friends who are always willing to be my taste testers for new recipe attempts. Before I knew it, people were calling and asking me for baking advice, very much the same way I used to call my Mom for advice. Here are a few simple baking tips that I learned from Mom and from trial and error. I hope you'll find them to be useful, and just maybe you'll be inspired to give it a try! Wait, let me say that again. FOLLOW THE RECIPE! This was the first piece of advice my Mother ever gave me about baking. Even if you read the recipe and you think "Well, it would be easier or faster if I did it THIS way instead..." Don't do it! Someone tested this recipe, probably several times, and this was the best version. After you gain a little experience, you can experiment with recipes, but always do it as it's written first, and save the experiments for the second or third time you try a recipe. 2. Read the entire recipe before you do anything. There's nothing worse than getting halfway through the recipe and realizing you don't have all the ingredients, or maybe there's a specific tool that you need in order to do a specific recipe. For instance, if you wanted to try a recipe for home made ice cream, you'd want to read the whole thing to see if it's a recipe that requires an ice cream maker, or if it's one that you can just place in the freezer. I know I've said this before, but it's worth repeating. When you cook, you can throw in a little of this and a little of that, but it's different with baking. There's a definite science involved here. Each ingredient serves a purpose, such as binders and leaveners. 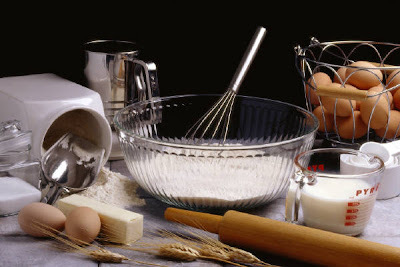 In order for the cake to rise, or for the custard to set, you need to add ingredients in the correct amounts. People who say they can cook but can't bake are really just saying that they don't measure. Use dry measuring cups for dry ingredients and wet measuring cups for wet ingredients. 4. Learn about your ingredients. Ok, I know I'm about to contradict what I just told you, but every rule has an exception, right? Yes, you need to measure everything, but there are some baking ingredients that don't have to be exact. For instance you can add shredded coconut or chopped nuts to a cake and it won't affect the interaction of the ingredients. It always helps to know which ingredients are important for the chemistry of baking (like baking soda or baking powder), and which ingredients you can add to taste. The more you learn, the more you'll know how much leeway you can take. It's pretty safe to say that anything that you add specifically for flavoring can be adjusted to taste. So go ahead and add extra orange zest, or a little extra vanilla extract, if that's what you like. It'll turn out fine! Whenever a dessert recipe calls for the addition of salt, don't omit it. Many people think, "Well, it's a dessert, I don't want it to come out tasting salty." It's true, you don't want it to taste salty, but desserts still need salt. It makes everything taste better, and actually brings out the sweetness of the other sweet ingredients. If you're worried about your sodium intake, then just use a salt substitute. It might seem like common sense, but I'll say it anyway. How else can you know if it's right? If you don't taste it, then you're just guessing. Basically, if the batter tastes good, then the final product will taste good. Some people may be concerned about tasting a batter that has raw eggs in it. Frankly, I never worry about that. I remember Sara Moulton saying that only about one in 20,000 eggs might be spoiled, so it appears that the odds are in my favor. Not only that, it seems to me that I'm not really consuming that much raw egg just from one little taste. 7. Grease and flour your pans*. You want to be sure that your cake will come out of the pan in one piece, so be sure to not only grease your pan but also flour it as well. You can also use a baking spray, which is an oil spray with added flour. You can also use parchment paper to insure that your cake will come out easily. Just spray your pan with baking spray, then cut out a piece of parchment to fit the bottom of your pan. Place the paper in the pan, then spray the paper. I recently used this method when I baked a 12" round layer cake and the layers popped right out of the pan. I have to admit, I never follow this one, but it's what Mom always said to do, and it's a good habit. Mom always disagreed every time she'd hear someone say "A messy cook is a good cook." For some reason, whenever I bake something, I always wind up using every kitchen surface, every bowl, and every spatula in the house. Then of course, I'm left with a kitchen that looks like a cyclone went through it. It's usually around that time that I wish I had listened to my Mother. Even if a recipe says to take it out of the oven at a certain time, not all ovens are calibrated equally, so you may need to adjust your baking time. My oven is old and doesn't exactly bake at the correct temperature. It usually bakes hot, so I have to lower the temperature setting, and bake it for less time. I always check it about 3/4 of the way through baking time, just to make sure everything is going as planned. If your oven is too hot or too cool, you can adjust your time to make it turn out correctly. You can tell when a cake is done just by tapping it lightly with your finger. If the top springs back, then you know it's done. If you leave a finger print in the cake, then continue baking. You can also insert a wooden toothpick into the center of the cake. If it comes out clean, then it's done. 10. ....but don't overbake it. Of course you don't want your cake to still be batter when you take it out of the oven, but it's just as bad to go to the other extreme. The longer you leave the cake in the oven, the dryer it will become. (And with cookies, the harder and crunchier they'll become). I always underbake cookies just a bit. Since I like a them to be soft and chewy, I always take them out of the oven just under the listed baking time. It may sound a little obvious, but it's still worth saying. You've just put the cake in the oven, you look at the clock, and with the best of intentions, you say to yourself, "ok, I have to take it out at 6:00." Then you get distracted and before you know it, it's 6:30, and your kitchen now smells like burnt cake. Trust me, I've been there. Now I always use an inexpensive wind up timer and sometimes even the alarm on my cell phone, (just because it's really loud). I've used the microwave as a timer (with the heat setting at zero) but sometimes I need to use the microwave in the middle of baking. The alarm on the phone is just easier! 12. Use a baking sheet. If you're worried that a pie or casserole will bubble up and spill over, place it on a baking sheet before putting it in the oven. If it bakes up and over, at least it won't spill all over the bottom of your oven. If you don't have a baking sheet, you can also place a sheet or two of aluminum foil on the rack below your dish. The foil will catch anything that spills, and then you can just crumple it up and toss it when you're finished baking. 13. Improvise, if you need to. If your cake breaks into pieces when you attempt to remove it from the pan, don't worry and don't panic! You can always improvise another dessert. Make a Trifle! Make Cake Balls. You can cover a million imperfections with frosting or pudding, or pie filling, and no one will ever know the difference. Even if a recipe doesn't turn out exactly the way you were hoping it would, chances are that your guests would never know that. All your guests can see is a fabulous home made creation sitting in front of them. Why lower anyone's expectations? *For a video demonstration of how to properly measure your ingredients, and also how to grease and flour your baking pans, watch my Baking Tips video! Great tips, brudder. And one more I'd like to add -- Always share your creations with your favorite sister. Very important.